MPNforum: Congratulations. As patients, we have a few questions for you. What do you consider are some of the most important aspects of these Ruxolitinib trials? 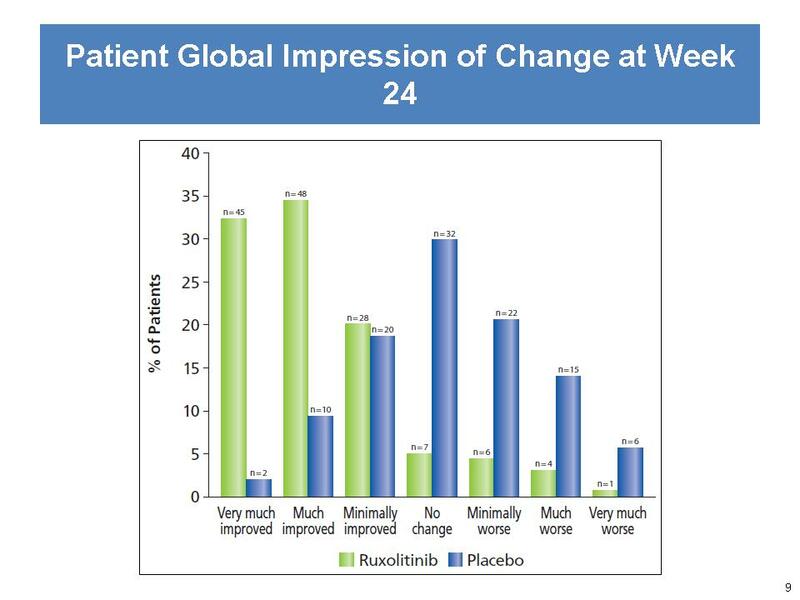 MESA The current clinical trials both COMFORT I and COMFORT II are the two largest studies ever done in the history of myelofibrosis and the first randomized placebo controlled study so it really helps to validate the symptomatic improvement issue to a much greater degree than anything else we’ve done before. 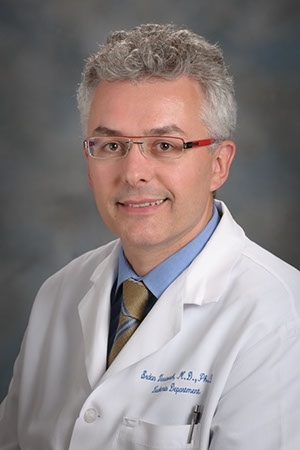 VERSTOVSEK: If you look at the individual patient’s response, in terms of shrinking the spleen all except two patients – and there were 155 patients in the Ruxo arm – had some degree of spleen shrinkage. The average shrinkage of the spleen was 33% for all the patients on the Ruxo arm. The spleen progressed on the placebo arm on average about 8% over six months. 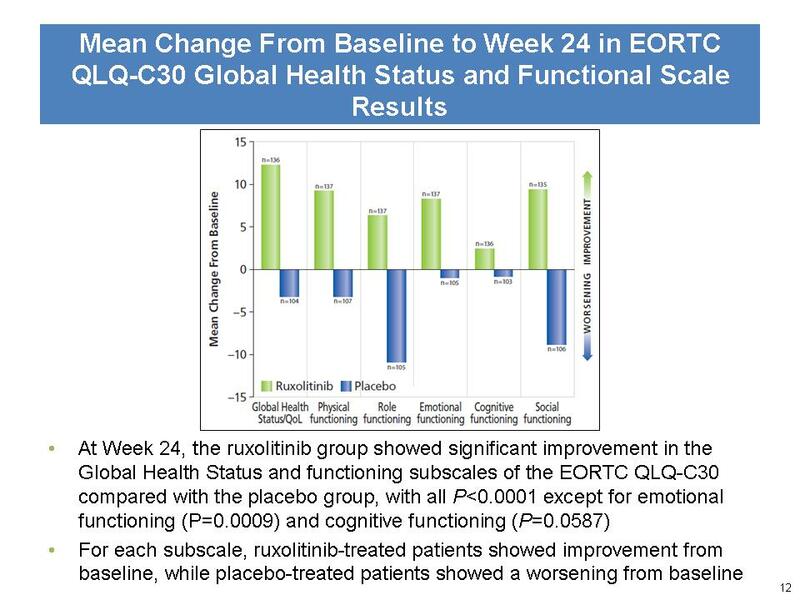 In terms of symptom control, for all the patients on the RUxo arm, mean improvement was 42% in the Total Symptom Score (the sum of scores for itching, night sweats, bone/muscle pain, abdominal discomfort, pain under the ribs on the left, and early satiety, measured by the MF Symptom Assessement Form, on a scale 0-10), At the same time, in the placebo arm there was a mean worsening of 42% over six months. So I think the therapy is very effective in what it does. 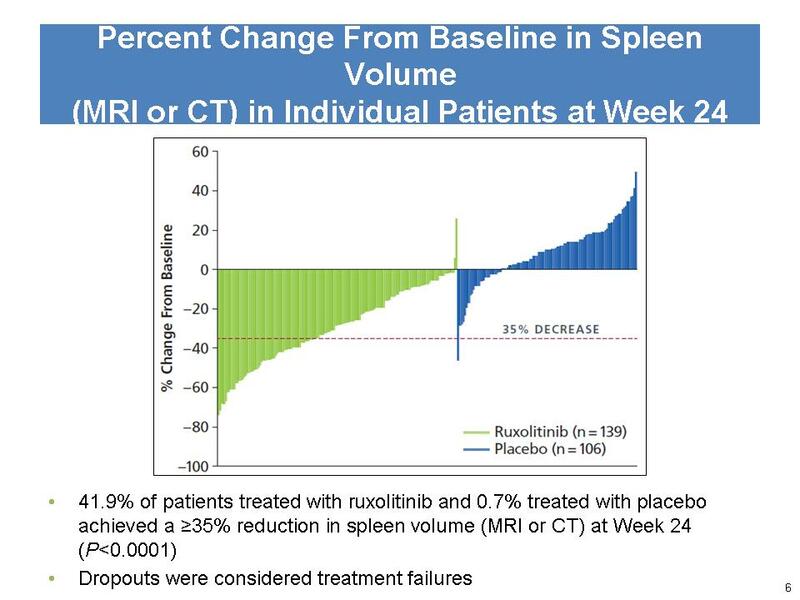 MPNforum: We heard that Ruxo will help relieve symptoms of myelofibrosis but it won’t stop progression of the disease. Is that right? MESA: When it comes to the issue of progression, there I would say that, at this point in time, we don’t know for certain if there’s an impact on progression because the studies were not designed to measure that There well may be but the studies weren’t designed or powered for that and we haven’t had adequate enough follow up to make that determination. We can’t say that from the studies but that possibility remains that that there is improvement in progression and survival. It’s something we’ll learn more about over time but not a claim that’s being made at this point. It would be inaccurate, however, to say the therapy doesn’t help the issue of progression. MPNforum: What about extending survival? MPNforum. What about combinations of drugs. If I’m on HU now, will I be able to take Ruxo as well? VERSTOVSEK: Everyone is talking about combination studies. Because you are blocking this pathway and you are controlling this disease we need to add something to be able to eliminate it. There are a number of options, low dose Pegasys, maybe thalidomide or maybe lenalidomide and there are a number of investigational targeted agents against different proteins that could be combined with Ruxolitinib that are being considered. MPNforum: If I’m JAK2 positive with PV is there any way of knowing if my PV will progress to MF? VERSTOVSEK: You probably know that by now we have evidence of about 10 different mutations in myeloproliferative diseases not just the JAK2 mutation. And in the myeloproliferative diseases like MF you have patients with multiple different clones at the same time present in their blood. And what we talk about in MF is a multi-clonal disease and the JAK2 mutation positive clone is just one of them. Sometimes some cells may have more than one mutation, and the other cells no mutation at all, both population of cells present in the same patient. And the elimination of the JAK2 positive cells, the mutated cells, may not mean a lot in the overall picture of the disease. This is probably now accepted by everybody. And the real clinical proof of this concept is the fact that MF patients who are JAK2 positive, when they transform to acute leukemia these patients become JAK mutation negative, most of them So people say how can this be? This is because it is a multiclonal disease and the mutation that leads to transformation to acute leukemia is not in the JAK2 mutation-positive cells, it is in the other clone, and that other clone takes over and transforms the patient to acute leukemia.
. MPNforum: I have a question about fatigue. Since fatigue is the top of the list of MF symptoms compiled by you and Dr. Tefferi why doesn’t fatigue appear in your MF symptom assessment form used in this trial? MESA: Fatigue is an incredibly important issue for patients and their physicalns. Fatigue hasn’t been an endpoint for the groups that approve medications whether FDA or the European Medical Association. They view fatigue as multi-factorial and prefer not to include it as a reason for drug approval. I can tell you that people on Ruxo certainly feel better. That’s not an endpoint for the official results of the clinical trial because of the realities of the drug approval process. Relief from fatigue is a major reason why people will benefit from this medicine. I myself have treated over 60 to 70 people with Ruxolitinib and know it’s a major benefit, no question about it. MPNforum: Along those lines, we’re publishing data and charts from the study. Is there something behind those figures that would be important to know in understanding the results of this trial? VERSTOVSEK: Yes. For example, 35% volumetric reduction in spleen as a goal of the study was arbitrarily set by the FDA for purpose of a clinical trial and possible approval, but has nothing to do with a patient responding to a drug or not. A patient can have a 25% reduction in spleen volume and as a result gain 15 pounds, walk 70 meters further, eliminate bone pain, abdominal fullness and itching, and go dancing weekly. I’m giving you real life experience. Also, cachexia resolves in almost all patients and performance status improves as well. MPNforum: Was there any reduction in JAK2 allele burden? VERSTOVSEK: Some patients may have a degree of JAK2 allele reduction but this is not clinically relevant. No currently tested JAK2 inhibitor has the potential to eliminate the JAK2-mutation positive cells. This is because of the way they work. They’re not specific for the mutation. They inhibit the normal JAK2 as well. In practice this means they inhibit normal cells that grow as well as abnormal cells. I have been involved with ten different JAK2 inhibitors and none of them is specific for the mutated enzyme. They inhibit all the cells. 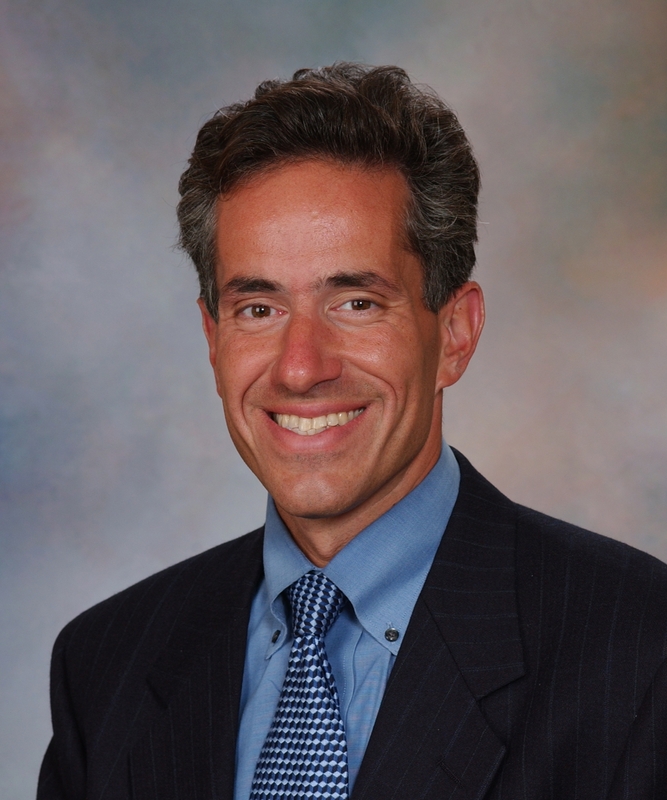 MPNforum: What about anemia and platelet reduction? VERSTOVSEK: Anemia and thrombocytopenia are the main side effects of the therapy They are managed by adjusting the dose The anemia and thrombocytopenia are usually transient. By six months into the therapy the number of people who have these issues decreases to the level you see in the placebo arm. By this time it goes away. VERSTOVSEK: : If platelet levels are already very low this medication is not good for htose patients because it will not improve th eplatemetns. This medicaito is good for patients with a relatively good number of platelets, not very low. There are two studies underway to evaluate this issue in detail, these are studies with ruxolitinib specifically for patients with low platelets. we will learn how to use it in this situation. MPNforum: What impact will Ruxolitinib have on the MPN drug development environment? MESA: For many years I worked with my colleague Ayalaw Tefferi on new drug trials for MF. Most of that time we we trying to basically convince drug companies to let us use their drugs that were basically developed for other reasons in myelofibrosis . MF was not obviously on their radar screen. The discovery of the JAK2 mutation, and the potential of JAK2 inhibitors, put MF front and center. That type of energy and enthusiasm from the drug development world, and scientific community, had led to a lot of research into MF pathogenesis and excitement in the drug development world. It will all be very helpful for the myelofibrosis patient. To assure you and other patients I think we all recognize Ruxolitinib is a beginning but not the finish line, But it is a step. I was diagnosed with PV almost a year ago. I have had phlebotomies at different intervals as needed. I am taking 500 Hydrea four days a week and a 1000 on the other days. I live in Birmingham, AL and currently under the care of a Hemotoligist. The more I read I think I may need to see a MNP specialist. Don’t think we have one in Birmingham, do I need to see one and how do I know where they are located? Hi, Pat… I just checked the List of Hematologists https://mpnforum.com/list-hem./ and there is no MPN specialist listed for Alabama. (Strange omission since the other Southern states are well represented.) So your search can do double duty. Once you find a good doc — and YES you definitely need a consultation with a specialist familiar with MPNs — please share her or him with us on that List page. Meantime, let me suggest you put your quest on Facebook… the MPNforum Facebook page and Myelofibrosis Support and the severa PV pages are excellent places to start. But please don’t delay. There’s also a paper summarizing current thinking on managing PV in the MPN Quarterly Journal http://mpnjournal.org/the-pv-papers/ that you might want to read and share with your doctor. Good luck and keep in touch. I have PV, my cousin has MDS and our grandfather had myeloma, should our children be tested. Could agnogenic myeloid metaplasia, be classified as part of the myelodysplasic syndromes?